This week teens from Beyond Differences were joined by Mayor Ed Lee and Superintendent Carranza at Aptos Middle School to launch Be The One, a new initiative to combat social isolation in middle schools. The buzz about Be The One started early on Monday morning with Twitter “blowing up” with tweets from Snoop Dog, Will.i.am, Governor Brown, MC Hammer, Lt. Governor Newsom, Joe Montana, Ron Conway and Twitter Founder Jack Dorsey, who also showed his support by attending the launch event. With all the chatter on social media on Monday, #betheone was the second-most popular hash tag on Twitter in the world. Millions of people shared their supportive messages about reaching out to someone new. Be The One is both a grassroots and digital movement to change the culture in middle schools to one of inclusion. 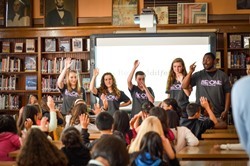 This teen-led movement includes school assemblies, teen activism, life skills education and interactive tools to help teens connect and challenge each other to Be The One every day. Several students from Beyond Differences held an assembly for 7th graders at Aptos Middle School and engaged with them on how they can be more inclusive by just saying hello to someone new. The program included Marin County Superintendent of Schools Mary Jane Burke, who talked about the impact Beyond Differences has had in Marin County. San Francisco Unified School District Superintendent Richard Carranza followed by talking about the importance of inclusion and how thrilled and proud he is to have Be The One in his school district. San Francisco Mayor Ed Lee then spoke to the 7th graders and praised the Teen Board of Beyond Differences for their leadership role in changing the culture in middle schools. After Mayor Lee finished speaking, Ron Conway, a philanthropist and supporter of Beyond Differences, told the students about the digital program and how they can use social media in a positive way. The digital component includes daily reminders to engage in random acts of kindness on Facebook and the website www.BeyondDifferences.org/BeTheOne. Videos, photos and blogs showing teens making a difference, #BeTheOne, will appear on Facebook, Instagram, Vine, Tumblr and Twitter. Messages about friendship, kindness and taking action started to show up on social media channels early Monday morning and have continued to build momentum.